Much of my childhood was spent with my grandparents in the New Mexico and southern Colorado region, so much of my work has been about the struggles and difficulties encountered by Latino and Native peoples. Generally speaking, I create mixed-media installations mimicking the ethnographic museums. Unlike a traditional museum of natural history, my installations attempt to offer positive and complex representations of my culture and beliefs. Bone-Gross Boy: The Secret Banks of the Conejos River is a literary trope of the frontier novel of the late 19th century. These novels often depicted Native and Latino inhabitants as ridiculous personages encountered on an otherwise naturalized conquest of the West. Bone-Grass Boy is their nemesis. Begun as a series of stories told to me by my grandfather, Bone-­Grass Boy has evolved from family genealogy, regional his­tories, and some historical material related to the Native American berdache tradition. The berdache (or transgen­dered spirit) dates back to pre­conquest America (North and South) and remains a prob­lematized position within the Latino/Chicano culture. The Bone-Grass story is set dur­ing the Mexican/American war (1846-48), a period that saw bitter struggles between cul­tures. American industrialism caused the economic collapse of the pre-industrial Southwest. Berdachism, greatly diminished under Spanish Christianity, fared even poorer under U. S. assimilationism. As a project, Bone-Grass Boy parallels the effects of industrialism with the effects of digital technology today, raising questions about cultural preservation and rein­vention, while strategizing a position within technologies of the future. My work frequently makes use of elaborate tableaux com­prised of painted backdrops, props, and realistic cast figures, and are presented along with digital photographs depicting the characters. 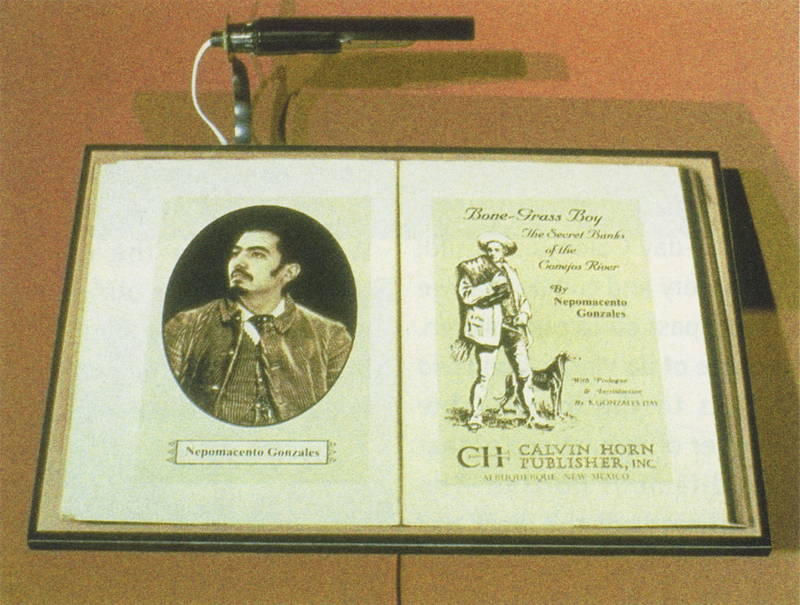 The digital pho­tographs, printed as c-prints, also incorporate painted back­drops, props, and historical images. As for the characters, there is Ramoncita, the Native/Latina berdache (based on a true story) who is forced to kill the rancher to whom she has been sold, and Nepomacento, the New Mexican soldier who fights for Mexico, only to have to sneak back to his homeland, now America. I play all of the characters in each image, disguised, digitally modified, cast, carved, or paint­ed. The strategy draws in part on Donna Haraway’s essay, “A Cyborg Manifesto,” in which she heralds the coming of a hybrid of organism and machine. For Haraway, the cyborg represents a kind of idealized postgender positionality, but Bone-Grass Boy, with its inherent racial and cultural hybridization, adds a level of complexity to Haraway’s model. 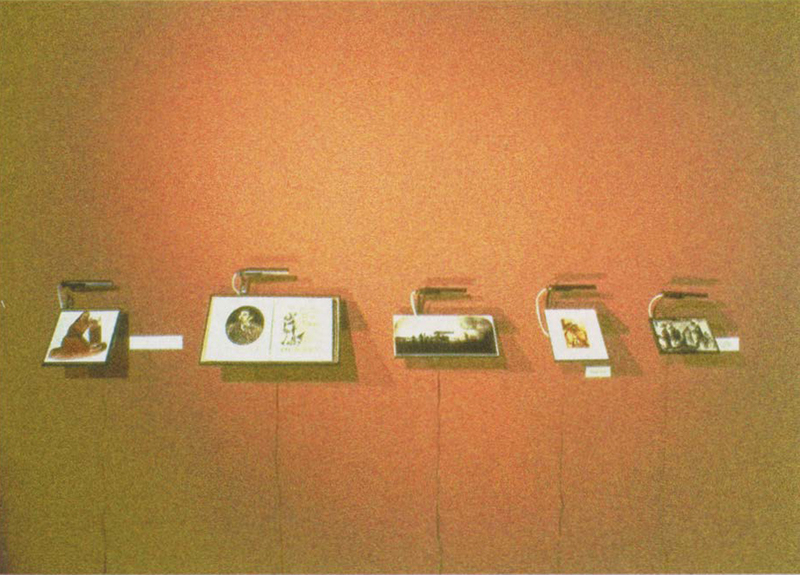 This, combined with the trappings of an ethnographic museum, allows us to consider Homi K. Bhabhas’ three-part strategy for the empowerment of the colonial subject, which demands a recoding of aborigi­nal or native cultures and begins to suggest something beyond Haraway’s utopic cyborg vision. It should be noted that while the work references a specific history, my goal is not simply to find these forgotten histo­ries and present them. It is to make their absence the subject, so that we can begin to look at some of the real issues in the debates surrounding the notion of cultural and racial representation. Like any good storyteller, Bone-Grass Boy raises difficult questions, and if we consider Judith Butler’s notion of a “pure dialectic,” then the tale begins to suggest the recuperative potential of technology, not simply by dis­rupting the status quo (the dark side of Modernism) but by strategically challenging how (and by whom) technology will be used in the future.